My new bacon & eggs- Hong Kong style! 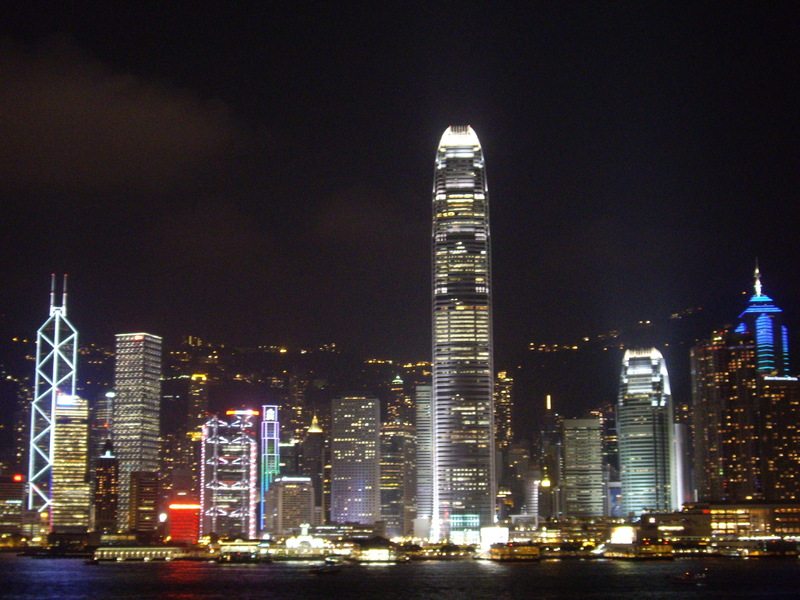 Having lived in Hong Kong for a couple of years, I got to know what was good to eat. The mix of cuisines is incredible in HK and there’s no telling what you might end up eating if you go wandering. I wandered. I ate. Some dishes stood out. This is one of those dishes. Barbecued pork (char sui) is everywhere in Hong Kong. The soy sauce seasons the pork beautifully and it pops up in a variety of dishes. One of my favourites was actually one of the first things that I ate upon arriving there. Not sure what to order in a local spot (in Prince Edward), I pointed to a photograph on the menu of what looked like scrambled eggs and pork. When it came to the table, I knew there was no going back. It was beautiful! Soft eggs, tender char sui and a sprinkling of chopped spring onions. It was gone before I knew what happened. Suffice to say that I was a regular after that and only recently did I decide to revisit that dish in my own kitchen. Belly pork makes your weekend scrambled eggs something special and it’s a fun alternative to what you might normally cook up. Check it out and see if you want to indulge. 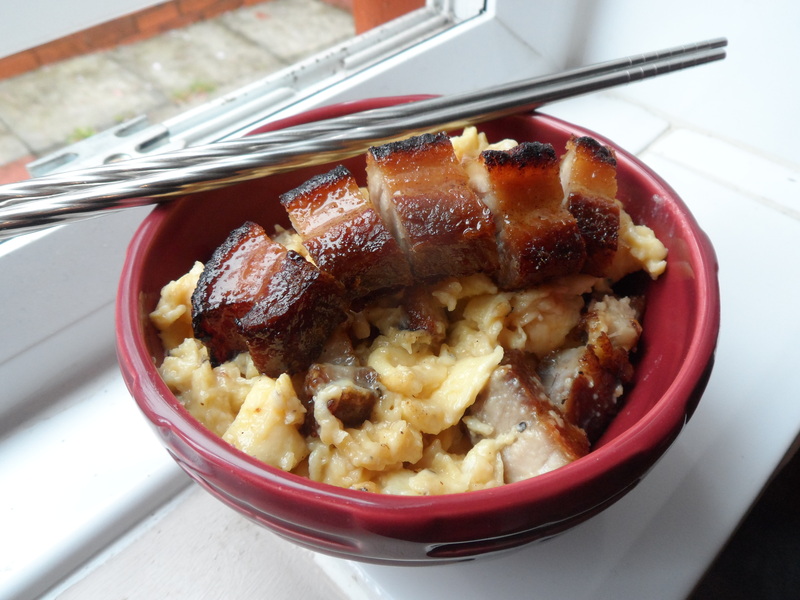 Scrambled eggs & char sui. Preheat your oven to 180C and coat the pork slices with a little olive oil. 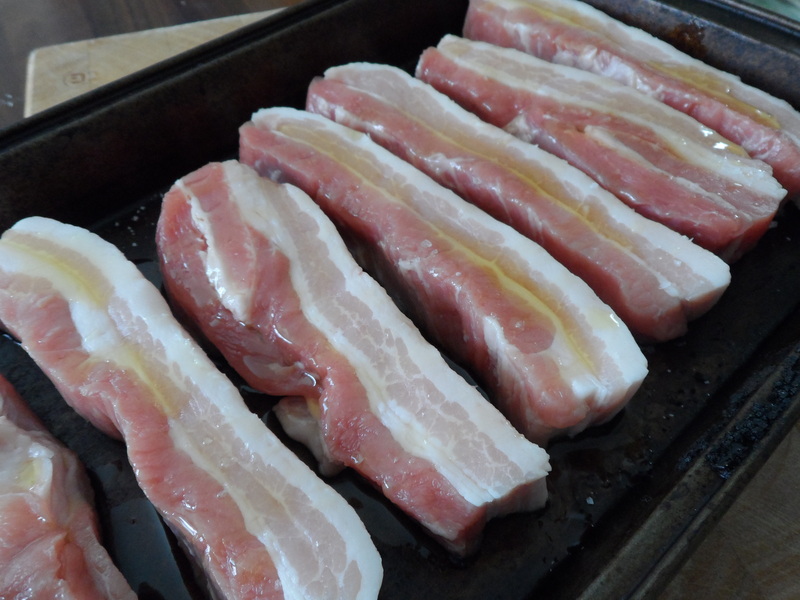 Don’t use too much- belly pork is fatty enough and when this renders, your baking tray will become filled with too much liquid. Cook the pork for 30-40 minutes turning once. The next step is to glaze the pork to add flavour and make it look appetising. Mix the soy sauce, honey and five spice together and brush onto the pork. Put the pork under a grill on medium heat and add more glaze as it begins to crisp up the outer edges. 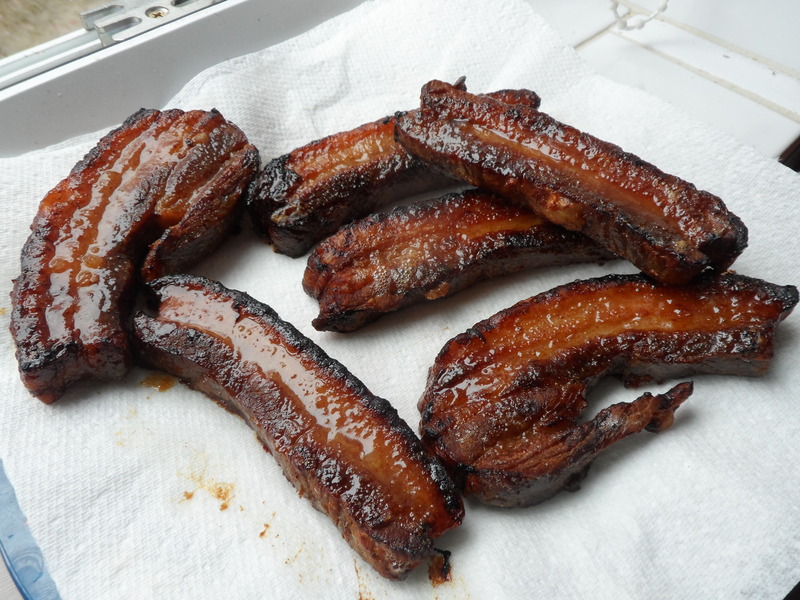 Try not to burn the pork- instead, turn the slices and continue to brush more glaze on. 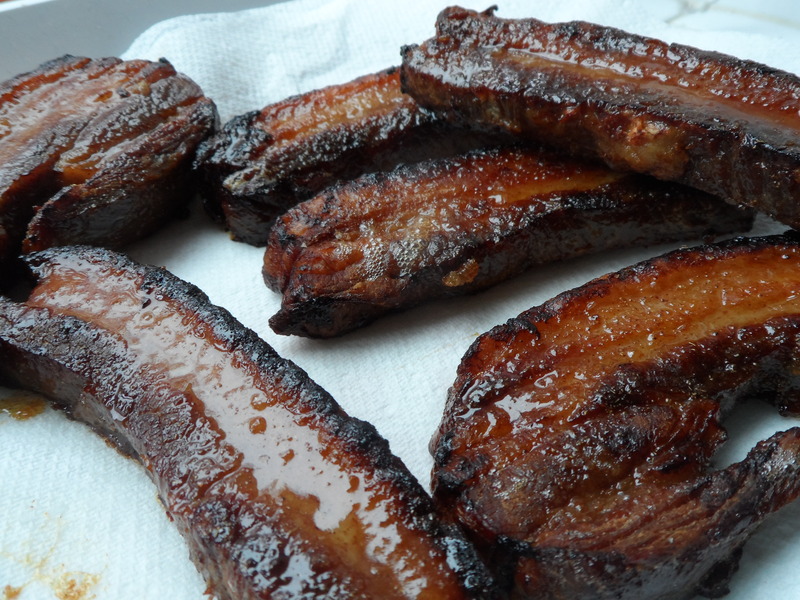 You should end up with tender pork covered in a sweet glaze. Sprinkle a little sea salt on if you need extra seasoning. Leave the pork to cool slightly while you cook the eggs. First things first: scrambled eggs should be made slowly. If you want soft, buttery eggs, you have to spend some time cooking them gently. Lot’s of butter. Low heat. I always use lots of butter, but you should make it to your won taste. Heat the butter in a pan on the lowest heat until it is bubbling and turning to foam. Beat the eggs and pour them in. Use a wooden spatula to gently move the eggs so that they don’t stick to the bottom. Try not to keep stirring. Allow the eggs to set slightly before moving them. As the eggs begin to come together, throw in some sliced spring onions and finish stirring. It’s best to take the eggs off the heat early so that they don’t dry out, but remain on the runny side. Chop the pork into nice chunks and stir into the eggs before serving. Simple, but satisfying. Admittedly, I didn’t have spring onions on the day I photographed this, but it tasted great regardless. 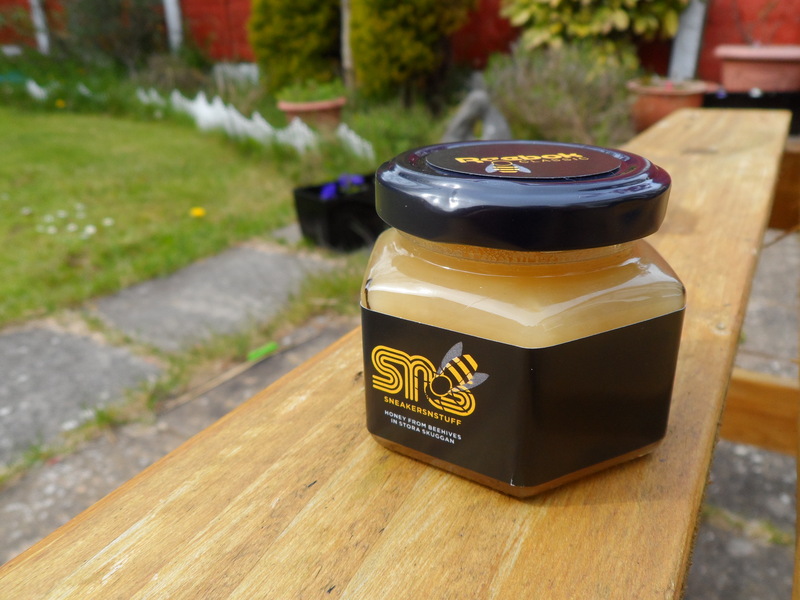 Having just treated myself to some fantastic Reebok Ventilators, I had a jar of SNS honey from Stockholme which came free with the shoes. This was the perfect recipe to use it in and I was really pleased with the results. My new weekend breakfast favourite and a great way to take myself back to Hong Kong memories. This entry was posted in Scrambled eggs & char sui and tagged 5 spice, bbq, breakfast, char sui, Chinese, food, HK, honey, Hong Kong, Pork, Reebok, scrambled eggs, Sneakersnstuff, SNS by Dimitri @ The Last Piece of Cake. Bookmark the permalink. Thank you! You won’t be disappointed! Yum.